After a Cancer Diagnosis, Which Risks Are Worth Taking? June 15, 2018 – Jane Biehl, Ph.D.
Jeff Young, D.V.M., refused to let cancer stop him from living. JEFF YOUNG, D.V.M., learned of his lymphoma after getting shooting pain in his arm and jaw. - PHOTO COURTESY OF JEFF YOUNG, D.V.M. HE’S KNOWN FOR HIS straight talk and passion for pets. 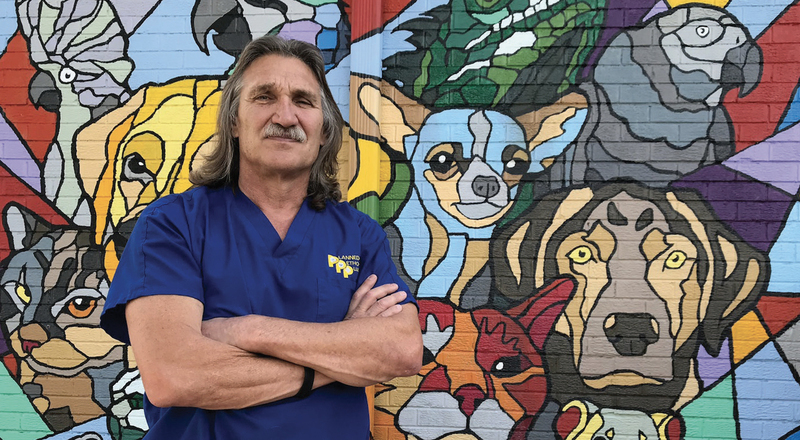 But most people may not know that the man who helps improve the lives of animals every day was fighting his own health battle for some time while doing it. Jeff Young, D.V.M., star of the Animal Planet show “Dr. Jeff: Rocky Mountain Vet,” had B-cell lymphoma. Diagnosed in 2014 with the blood cancer, he received the standard chemotherapy treatment of cyclophosphamide, doxorubicin, vincristine and prednisone, more commonly known as CHOP. In an interview with Heal ®, Young explains why he didn’t let this self-called “nuisance” keep him down and how he’s handling life as a cancer survivor. Heal®: How was your cancer discovered? Young: My cancer diagnosis was pretty simple. I was getting a massage — I do karate, and I go for a massage every now and then — and was on my chest. The (masseuse) was working on my back, and I kept getting this shooting pain down my arm. I thought it was just a pinched nerve. About two weeks later, the same thing happened, except I felt (the pain) in my jaw and down my left arm. At that point, I thought it was a heart thing. I went to the emergency room, and they thought it was a heart attack. They took an X-ray and found an 8-centimeter mass next to my heart. Two days later, they had a needle in my back that confirmed the B-cell lymphoma. Please discuss your health today. I feel great and have plenty of energy. I work out and go to work every day. I go for a CT scan every year and a half. Your wife cut your famous long locks while the cameras were rolling. Why did you choose to do this in a public manner? The joke has always been that my hair is my strength. I had undergone some treatment, and I knew my hair was going to come out. It was just a matter of when, so I figured I’d go on the offensive. Cutting your hair and being bald in this day and age … Well, Michael Jordan made it in vogue. You have your down moments and the “Why me?” (feeling). But for the most part, it was a matter of “I just have to get through this.” It was one more thing I had to do. What was your biggest challenge while fighting cancer? Not working as much as I’m used to. It bothered me that (the cancer) slowed me down. For 26 years, I have been coaching inner-city kids in distance running, and I didn’t get to coach much because I didn’t have the energy to run. I tried to work, but there were a few days when (I just didn’t) feel good, like a day or so after chemotherapy, and (I felt) nauseous. I tried not to let it change my life a whole lot. A positive attitude really makes a difference when you have cancer. What advice do you have for other survivors who may be struggling to get up? I get up every day and move forward. I don’t think you have a choice in life. With cancer, if you sit around, it’s not good for your immune system, and it’s not good for you psychologically. Get up and move. Go for a walk. It doesn’t have to be long. Interact with people. If you’re given lemons, make lemonade. What’s one message that you want to leave for anyone reading this? I had a great doctor, but when I asked about nutrition, yoga, meditation and other things, he wasn’t interested. It put me off and bothered me. Depending on your doctor and the program you’re in, find some outside sources that can give you support because it’s the whole body you’re treating. Doctors are treating (the cancer), but I’m more than just that. That 8-centimeter lump is not me. I really do believe changing my diet made me feel better, and I continue that. Do your research. Drugs are part of the battle — not the whole battle.